Gaucho can be downloaded here. Available versions for Linux, Mac and Windows (32 and 64 bits). To use, unzip in the desired location and execute gaucho (execute file depends on you OS). Gaucho allows you to configure tasks as part of different suites or groups you can access the different suites by clicking on its name in the navbar menu. On each suite, you will find the list of possible tasks to launch. By clicking on Run you will start that task. Clicking the same button again (now the Stop button) you can stop the tasks. You can easily see the name, execution time and status of each task. The status (shown with the status icon) can be idle (black), running (blue), successful (green) or failed (red). Clicking in the task name the log will be displayed, allowing you to check the task output in real time. By clicking the Edit button (on the top right corner) you&apos;ll be able to edit the suites and tasks. You can add new tasks to the current suite by clicking "Add New Task" at the bottom of the list. By clicking on a task name you&apos;ll be able to edit that task. While editing/creating a new tasks, you should add a name to the task and a command. The command can be any shell/terminal accepted command or an executable file. Optionally a path can be added as well, if no path is added, the gaucho execution path will be used. The tasks can be deleted by clicking the Delete button. While in edit mode, suites names can also be changed by clicking on it. To close edit mode simply click again on the edit button. 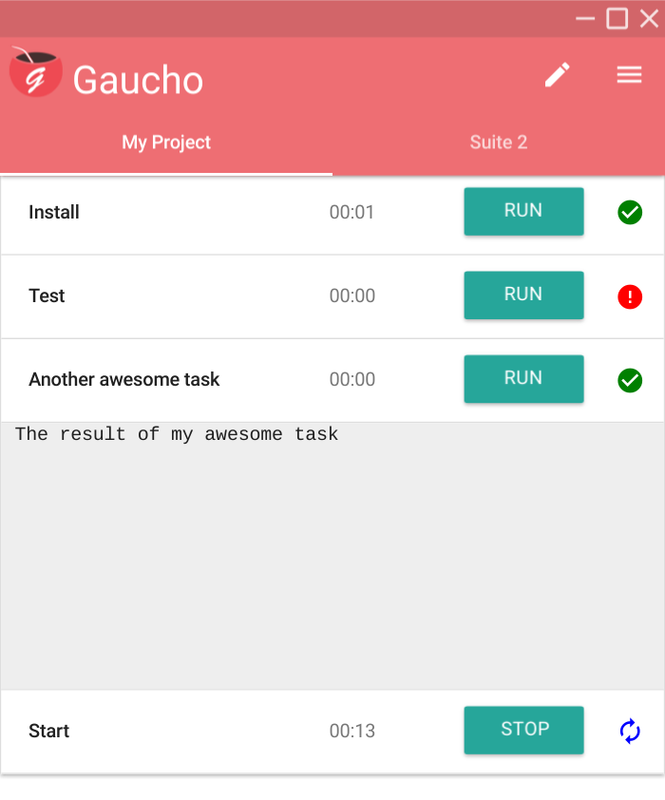 All tasks and user changes are saved automatically when closing gaucho. This includes all the tasks/suites information as well as the window size. If you want to contribute to Gaucho, create a new different version of Gaucho, or compile it from source code, follow these instructions. npm install to install electron and all the dependencies. npm start to start gaucho. npm run start-dev to run gaucho with chrome dev tools enabled. NODE_ENV=test npm start will run Gaucho in test mode, which will not store or change any configuration or tasks. npm run dist to build and package gaucho for your system. The artifacts are located in dist/. npm run dist-all to build and package gaucho for all supported architectures and platforms, it will take a while. npm test to run the automated tests. Please, ensure the tests are passing before creating a pull requests. Add tests for your changes. @aebsubis for designing Gaucho Logo.